Obviously my little family of 4 hasn't done any traveling since last summer before I was put on bed rest. To say we were ready and excited for a week of vacation was an understatement! This was also Liam's first trip, oh how exciting! When we travel on vacations with our extended family we are now a group of 15. We have kids in our family ranging from the age of 13 down to Liam who is currently 8 months. Noah was so excited to spend a week in Florida with his cousins. We had an awesome time and I'm sad to be back home. I'm already looking forward to heading back next year. It's hard to believe that next year Liam may be walking while we are at the beach. Here are some of my favorite pictures from the trip. We also got family portraits done on the beach which turned out awesome. It's hard to get a family of 15 all together in on place for pictures (with so many kids! ), so I'm glad we now have group shots of us all. The kids had a blast playing in the water while taking the pictures. 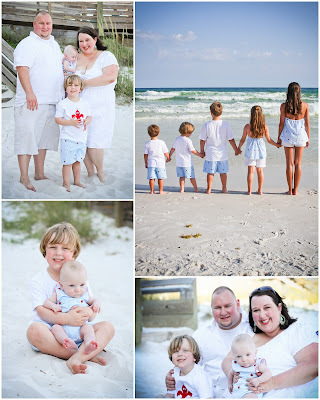 If you are looking for a photographer in the Destin area, please check out Jessica Aten Photography. I loved how the pictures turned out and she was so easy to work with and very patient with all our kiddos! The adorable outfits the kids are wearing were made by Sew Much Fun, they received tons of compliments on the beach. See you next summer Destin!